HUNG HOM, Hong Kong - July 28, 2016 - PRLog -- While breastfeeding has become more common across the globe in recent years, lactating women may not be aware of the nutrient adequacy of their breast milk and how their daily diet affects their nutrition intakes. 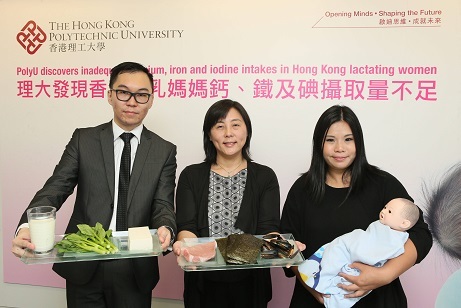 The research team at the Laboratory for Infant & Child of The Hong Kong Polytechnic University (PolyU)'s Food Safety and Technology Research Centre (FSTRC) has undertaken a study in breast milk to analyze the calcium, iron and iodine levels of breast milk of Hong Kong lactating women and their daily intakes of the respective micronutrients. This is the second phase of the previous research which unveiled the level of polyunsaturated fatty acids (DHA, EPA and AA) of breast milk and lactating women's average daily intake levels of DHA and EPA last year. PolyU researchers recruited 95 lactating women participants between May 2014 and August 2015. They collected breast milk samples and conducted a 3-day diet survey with the participants and subsequently analysed the levels of calcium, iron and iodine in the collected breast milk. Results revealed that about 51 percent, 74 percent and 48 percent of the breast milk samples of the 39 lactating women with 0-6 month-old infants met the adequate intake levels of calcium (200 mg per day), iron (0.3 mg per day) and iodine (85 μg per day) recommended by the Chinese Dietary Reference Intakes (DRIs) 2013 respectively. This suggested that, in most cases, breast milk could supply sufficient micronutrients to support infant growth from the day when they were born to six months old, the period before complementary foods would be given to infants. However, the daily intakes of calcium, iron and iodine of the 95 breastfeeding mother participants in the study were significantly lower than the DRIs' recommendations, with only 12 percent, 6 percent and 2 percent of participants fulfilling the recommended intakes of calcium, iron and iodine respectively. The lack of calcium may lead to osteoporosis, rickets or cardiovascular diseases. The adverse effects on health that may be caused by the lack of iron include iron deficiency anemia and impaired immune response. The lack of iodine may lead to hypothyroidism, goiter, cretinism etc. In view of the research results, Mr Gordon Cheung, Registered Dietitian and Project Fellow of the FSTRC of PolyU's Department of Applied Biology and Chemical Technology (ABCT), suggested that breastfeeding mothers consume a wide variety of food, especially dairy products, tofu, dark green leafy vegetables, meat, legumes, seafood and seaweed products so as to prevent adverse health effects such as osteoporosis, anemia, and warrant the optimal growth and development of infants and young children. Professor Wong Man-sau, Professor of PolyU's ABCT and Deputy Director of FSTRC said, "Our research results reveal that the daily intakes of micronutrients of Hong Kong lactating women are significantly lower than the recommended daily intake levels. Although we have only analyzed the nutritional characteristics of breast milk and dietary habits of lactating women, our major concern is the overall well-being of both breast-fed babies and their lactating mothers. Therefore, we suggest that our lactating mothers should ensure their nutrient adequacy before, during and after breastfeeding by making healthy and balanced food choices." The research team will work to develop a dietary guideline for lactating women in collaboration with other medical professionals and undertake community-based education work to achieve nutritional adequacy via balanced diet amongst lactating women. The research team would like to thank all the participants in the study, Hong Kong Nutrition Association, Hong Kong Catholic Breastfeeding Association, Hong Kong Breastfeeding Mothers' Association, La Leche League Hong Kong, MaMaMilk Baby Alliance, Natural Parenting Network, Integrative Health Clinic at PolyU, Centre for Nutritional Studies at CUHK, Dr Sophie Leung Suk Fong, Professor Su Yixiang of Sun Yat-sen University and the research team of PolyU's FSTRC for their great help and support to the project.